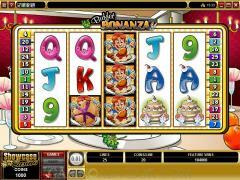 Buffet Bonanza is a video slot from Microgaming. Based on a food theme the slot game is a gastronomic delight. The reels are set in the background of an elegantly laid out dining table. The symbols on the reels are the items from the menu. They include Meat, Lobster, Cake and Salad. The high value card symbols crafted in bright colors make up the remaining symbols. The Diner is the wild symbol and the Buffet Bonanza Logo is the scatter symbol. 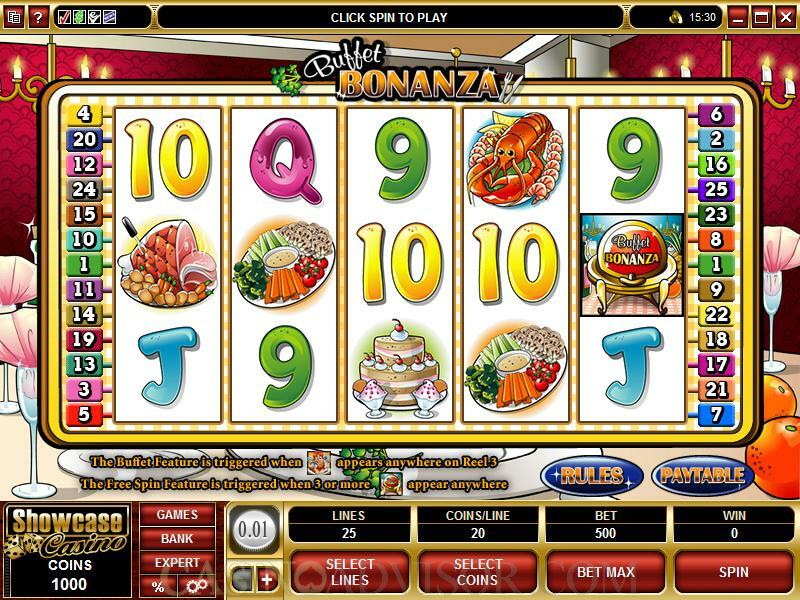 Buffet Bonanza does not have any progressive jackpot. However the fixed jackpots are attractive. Five Meat symbols in an enabled payline have a payout of 6000 coins. Five Lobster symbols in an enabled payline have a payout of 3000 coins. Buffet Bonanza has plenty of betting options. The coin size range varies from 0.01 to 0.20. Players can wager from 1 to 20 coins per payline. The slot game has 25 paylines. The total bet range varies from 0.01 to 100.00, which makes the game attractive to both low rollers and high rollers. The Diner is the wild symbol. It appears only on reel 3. It therefore does not offer line payouts. Nor does it multiply payouts. However when it appears on reel 3 it always triggers the Buffet Feature. This is a unique bonus round. The Diner symbol first takes all positions on reel 3 and all Diner symbols act as wild. The remaining reels are re-spun without any additional amount wagered. Then pies are randomly thrown on the reels. The symbols they hit automatically get converted to the wild Diner symbols. The payouts of the Buffet Feature are then calculated. Since there will be at least four wild symbols on the reels the Buffer Feature usually hands out large payouts. This feature cannot be triggered during the free spins. The scatter symbol offers payouts when at least two appear anywhere on the reels. When three scatter symbols appear anywhere on the reels the Free Spins Feature is triggered. In this feature 10 free spins are awarded at doubled payouts. During the free spins the wild Diner symbol is added to reels 2 and 4. The Free Spins Feature can be retriggered if three or more scatter symbols appear on the reels during the free spins. If the Buffet Feature and Free Spins Feature are triggered in the same spin the Buffet Feature is played out first. The Gamble Feature is also available. After every payout players can opt to try to double or quadruple their payouts. In the Gamble Feature they can select a color or a suit. If they guess right then the payout is doubled or quadrupled. If they guess wrong then they lose the payout. 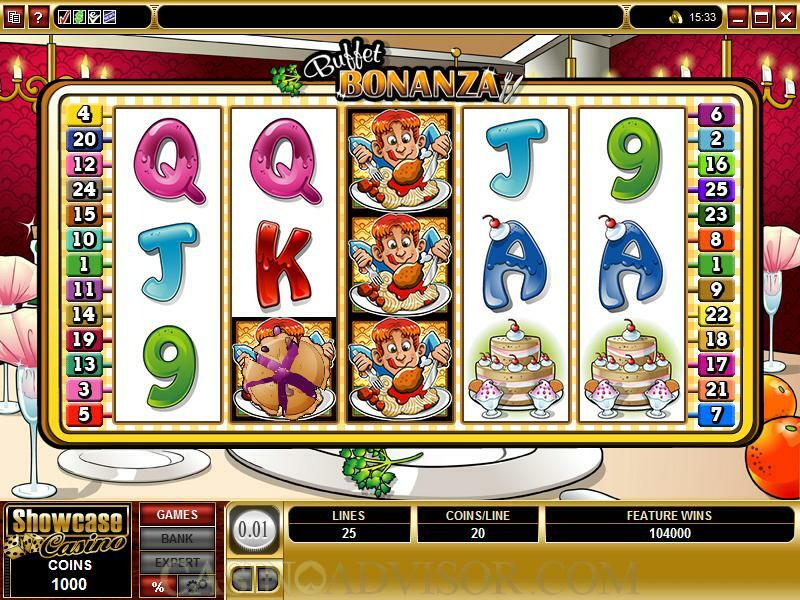 Interested in reading more detailed information about Buffet Bonanza? If so Click Here for more details.